Surface preparation is crucial to achieving pleasing, long lasting results. Often, the surface preparation begins with patchwork.. Preparing walls and applying single color paint to them is one thing, but achieving detailed custom faux finishes can be quite another. 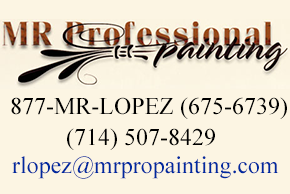 MR Professional Painting is based in San Ana, CA and serves all of Orange County and surrounding areas. We do all types of residential and commercial painting, but the superlative result is only the end product. Our company does so much more than apply paint and stain to target surfaces. We do both interior and exterior work, and we specialize in custom finishes using only the highest quality paints and coatings. Our professionals approach all of our work with care and attention at every step, beginning with fully protecting all furniture and floors in the rooms where we are working. We have an extensive list of references, which we gladly will provide on request.